Ionic is an incredibly useful framework for building HTML5 hybrid mobile apps. It is a great starting point for creating Cordova/Phonegap mobile applications. It provides common mobile app components that are reusable and adaptable. Ionic also provides a very useful CLI (command line interface) that allows you to create, compile, run and export mobile apps with ease. It is continuously adding new features pushing it beyond just a front end framework. Need to put together a prototype before building a native app or responsive web app? Ionic is a great choice for prototypes too. In this article, I wanted to provide an overview of some of the most useful things I uncovered. I hope that it helps new developers get their own apps up and running faster. These guides will assume you’ve got a project up and running in your CLI. We will use one of the templates found on the Ionic “Getting Started” page. For example, ionic start myApp blank. This is definitely the best way if you’re starting from scratch. You’ll get access to all of the Ionic CLI features along with their core starting template. I’ll start with something almost every app will want to do – customization. Where Is the Best Place for My Custom Styles in Ionic 1? I’ve played around with a few ideas within the project structure looking for the best method. One that would be clean for my own expanding projects but would also work with the ionic Gulp set up. I didn’t want to change the default Ionic Gulp file unnecessarily. Just Put Styles in www? It may be tempting to rush into things and throw new scss files into the www folder somewhere. Near the code for the Ionic styles and then add a reference to your CSS file within the index.html. Avoid that! It doesn’t work so well with the Ionic Gulp set up. Better not to add things in there. In the folder called /scss, you should find an ionic.app.scss file. This is the main SASS file that compiles all the styles for your app. This is what Ionic’s Gulp set up will refer to. Want your code to work and compile with everything else, including live refresh? The ionic.app.scss file is self-explanatory. You can add plenty of new styles at the end of this file. This will work well for small and simple apps with a few customizations. Chances are, your app isn’t going to stay small and simple. It is going to grow and you are going to want it to remain manageable. This is especially true if a team of developers is involved (either now or in the future). For these reasons and more, I’d recommend splitting your custom styles into a neater set of files. The files should mirror Ionic’s sass files whenever we’re specifically overriding Ionic itself. Put these custom app styles into their own subfolder. I set up a folder which matches the app’s name within the scss folder. The main scss file for my custom styles matches that app name too. For example, for a social networking app for ants with the name Antstagram would have its styles in scss/antstagram/antstagram.scss. Within antstagram.scss, we’d then have several @import statements to import our other scss files like _variables.scss and _items.scss. This is done for those matching our Ionic framework. It is also done along with custom files specific to our app functionality like _antmountain.scss. Speaking of _variables.scss, there are a few ways to override Ionic’s variables. I’ll explain those in my next tip. 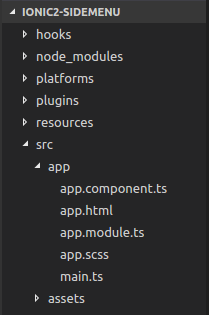 In ionic 2, the default folder structure places each component with its own SCSS file. This is where you should put all page specific styles. To customize the overall theme of your app, edit the src/theme/variables.scss file. This is where all the color variables are declared. The $primary color is the only required color. It is the default color used to style the buttons and other components in Ionic 2. A good approach is to set the color variables to the colors of your design. This should be done instead of declaring custom classes whenever possible. This ensures that the colors are applied consistently throughout your app. Do note, that the $colors map should only contain variables for UI components. Arbitrary color variables should not be placed here. How Do I Override Color Variables Correctly in Ionic 1? Ionic comes set up with a set of styles pre-defined and ready for you to customize and use. Before defining a ton of your own variables, have a look through the list of default variables first. Use them if they’re applicable to what you’re looking to style. So, why not just redeclare variables at the end of ionic.app.scss? Why are they all at the start of the file? The reason for this is that they need to be added before the ionic import. Otherwise, ionic’s default values will override your defaults. 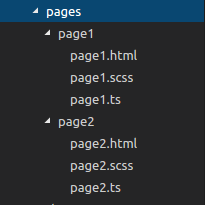 My preferred method imports in a separate scss file called _variables.scss in my antstagram folder. This is done before anything from Ionic is imported. Then the rest of my custom styles are imported inside my main Antstagram styles after Ionic. This is so they can override Ionic’s styles. In Ionic 2, overriding color variables is pretty straight forward. It is done by editing the variables declared in the src/theme/variables.scss file. I’m Missing Some Ionic Icon Fonts! If you head to the Ionicons website and start using these icons, you may find that there are some missing in your project. Chances are this is because Ionic didn’t install with the latest Ionicons set. Head to the Ionicons website, click that download button and get the latest version. Then, we can replace the Ionicons font files in www/lib/ionic/fonts. Replace them with the fonts in the fonts folder of the download. It’s simple and upgrades it to the latest version. We also replace the scss files in www/lib/ionic/scss/ionicons with the ones in the scss folder of the download. There does appear to be an extra scss file in here for animations – leave that as is and just replace the others. You might have noticed something contradictory here. Those files are within the www/lib/ionic folder and could be changed if we upgrade Ionic right? In my opinion, this is okay in this case. We’re temporarily bringing Ionicons to the latest version while we wait for Ionic to catch up. There’s the possibility you’ll lose icons if Ionic doesn’t upgrade as quickly. But, usually, the next upgrade of Ionic will also include the latest version of Ionicons. It also leaves it open for future upgrades to Ionicons to arrive automatically in updates of Ionic. Once you’ve updated your font files, you should be able to use the icon you couldn’t see before. Click q in your terminal to stop running ionic serve and then rerun ionic serve to get the latest icons. To get the latest icon set on Ionic 2, check your package.json. Ionic manages ionicons this way for new releases of Ionic. Just run npm install and you’ll have the icons all setup for you. Just keep an eye on on the new Ionicon Docs as some names have changed. that I can reuse across the app and keep up to date with any changes in one central location. New releases of Ionic have this functionality built into the framework. The ion-icon component will dynamically load the correct icon depened on the platform. You can still have a bit more control over what icon used by specifying the platform versions. Ionic has grown into a robust framework with a rich ecosystem of services. Hopefully the tips I’ve shared help those looking to embark on an Ionic journey of their own! If you’ve got any tips of your own to share or alternative ways to do the above ideas, leave your thoughts in the comments. A Guide to Styling an Ionic 2 Application. Charles Muzonzini is a Mobile App Developer specializing in cross-platform development using the Ionic Framework. He runs a Digital Agency, webgems and he writes mobile app development tutorials at Sitepoint.com and his developer blog, Muzonzini on Mobile. He is also the co-organizer of the Harare WordPress Meetup. Around the text, "This creates an element of", you forgot to escape the brackets and the code is swallowed. You're totally welcome, I appreciate the positive feedback Glad you found it useful!